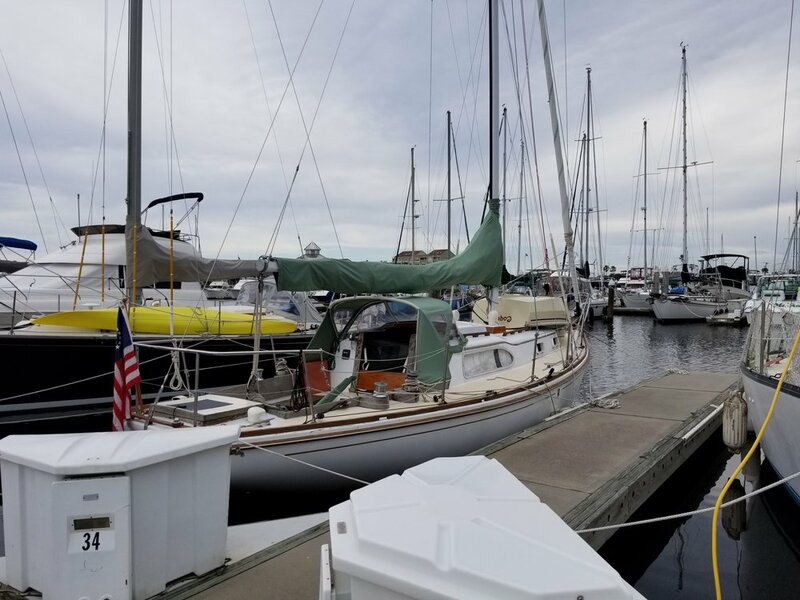 2/27 Wednesday, 73/61, partly cloudy, NE5-10, 1154.8 - Grace motored away from Titusville Marina at 6:30am, entering the glassy water of the Indian River. Fifteen minutes later, we were greeted by a beautiful sunrise. 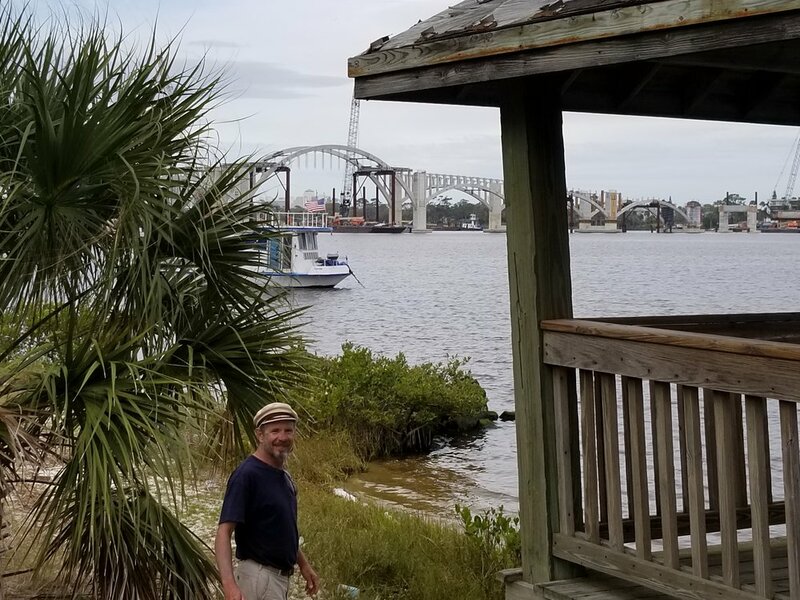 The breeze was light and from the northeast, so we motored - through Haulover Canal, up Mosquito Lagoon, and into the canals that stretch from New Smyrna Beach to Daytona. We saw two manatees and some dolphins. I admired the little fish camps at the north end of Mosquito Lagoon. I made reservations at Halifax Harbor Marina in Daytona, where we arrived around 2:30pm - slip F34. The dockhand stood by (at my request) as we maneuvered Grace into the slip. Then he gave us the “lay of the land” - where to find bathrooms, ice, dog walk. We toasted our first day with gin-and-tonics. Then I called our friend Peg to let her know we’d made it into town. She lives in Ormond Beach, about 12 miles north of the marina. Her brother (and our friend and Sippy Cup racer) Bud was visiting with his wife Gerry, and Peg invited us to join her for dinner at the Halifax River Yacht Club. We gratefully accepted. In between 3 and 6pm, we walked Murphy, showered, and fed the pets; then Peg picked us up for the short jaunt next door to the club. It’s a very fine yacht club, with a large and elegant clubhouse overlooking the river. For dinner, I chose Seafood Newburg, started with a Caesar salad and finished with ice cream. Dobbs had a salmon dish, house salad, and blueberry cake. Everyone’s meals looked delicious. We had a pleasant time catching up on family, weather, sailing, and politics. Dobbs and I requested an early evening because, as we were coming into the marina, we learned that Memorial Bridge (under construction) would be closed to navigation between 7am and noon. A photo taken earlier in the day - that’s Memorial Bridge under construction in the background. This means we’ll be clearing our slip at 6am tomorrow. The afternoon rain had stopped, so we walked home to the marina (to help digest). Dog walking rounded out the evening and we were in bed by 9:30pm.